Arborfield Hall was bought as a wedding present for Thomas and Sarah Hargreaves from the Conroy family in 1855. Thomas was the son of a Cotton Spinner from Accrington, Lancashire. His father John rose from office cleaner boy to a large manufacturer, amassing a large fortune. Thomas called himself “Captain Hargreaves”, on the strength of his being a Captain of Volunteers, or a Militia, in a trading town. Shortly after moving in, Mrs. Hargreaves discovered that she was related to the Dawson’s, through an American branch of the family. The 1901 Census shows that Sarah herself was born in Philadelphia, Pennsylvania, in about 1834. The Conroys looked down on the Hargreaves because they were considered “trade”. Captain Hargreaves was initially the model of respectability, becoming a J.P. on the Wokingham Bench in 1859, a Steward of Berkshire in 1864, rising to High Steward of Berkshire (involving him in various ceremonial duties) in 1867. He worked on the property, improving the mill channel of the River Loddon as a decorative feature for the formal gardens, seen here in this picture available on the Reading Local Studies web-site. His initials and the date ('T.H. 1863') can still be made out in an inscription on the stout wall of the mill-stream (see article on the Loddon here). In 1863, his relative, Sir William Brown, Bart., of Liverpool, provided funds to replace the dilapidated old church building with a new one on land closer to Arborfield Cross, employing contractors from Liverpool to carry out the work, which cost over £4,000. 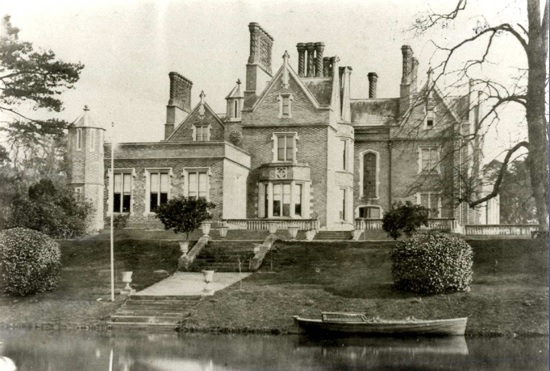 The family raised eight children at Arborfield Hall - but in 1870 the family was rocked by scandal when it was revealed in a court case (not published locally) that Thomas had had a relationship with a Mrs. Warriner. Only a month later, he bought a property known as The Mount, Bishopstoke on the banks of the River Itchen and gradually he and Mrs. Warriner were accepted in Hampshire as a couple. On the other hand, Thomas was almost air-brushed out of Arborfield life during the 1870s, only receiving a brief mention in the loacl press - though he was mentioned almost weekly in Hampshire newspapers. In 1873, Thomas' father John died, and left most of his considerable fortune to his eldest son and daughter-in-law. Thomas received £120,000 (enough to build a couple of dozen new Arborfield churches! ), while Sarah received no less than £200,000. Sarah was left to finish their children's education and to introduce them to marriage partners. She did well for them, according to the glowing reports of their weddings. "Rev. S. W. L. Walsh, rector of Arborfield, near Reading; patron, Mrs. Hargeaves, of Arborfield Hall". Mrs. Hargreaves enlarged the house and put in electric light using the old Mill for making electricity. The Hargreaves made the Hall one of the centres of village life, as can be seen from extracts of Parish Magazines, plus Mrs. Hargreaves was a generous benefactor. The Reading Room, built in memory of their son Arthur in 1881, was a great asset. Thomas died at his club in London in September, 1891, upon which local newspapers the length and breadth of England carried glowing obituaries, though the Berkshire newspapers were silent. They did however report on Thomas' burial at Arborfield. 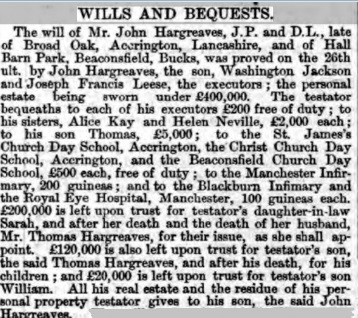 The contents of his Will may have been a surprise to some - it mentions two sons, not one (John Reginald). 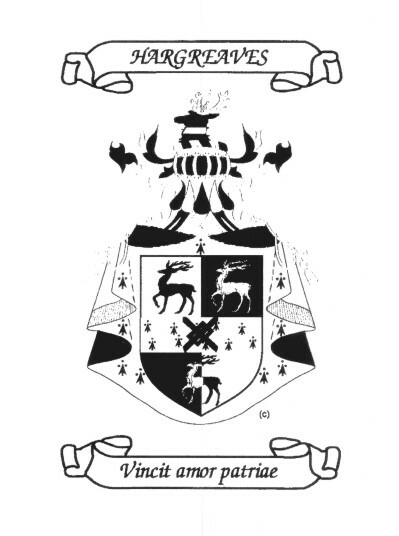 The second son Cecil Montague was born in 1871 at Bishopstoke to Mrs. Warriner. After Sarah's death in early 1918 (for Sarah's Obituary, click here), her son John became the new owner, but he didn’t like Arborfield. In 1919 and in 1924 he put the Hall up for sale, but unsuccessfully. However he finally succeeded in 1926, after which he severed his connection with Arborfield, though a memorial service for John Reginald Hargreaves was held in Arborfield following his death in December 1934. - Happily, Arborfield Local History Society now has an electronic copy of this book. Peter Ditchfield was able to trace Sarah's direct lineage way back to King Edward III, so he certainly earned his commission.